Bigelow Wins DGA Award for "Hurt Locker"
Kathryn Bigelow and "The Hurt Locker" became official awards-season front-runners Saturday after Bigelow won the top prize from the Directors Guild of America. The 58-year-old filmmaker is the first woman to win the guild's top honor, which positions her and the film as shoo-ins for the Academy Awards. 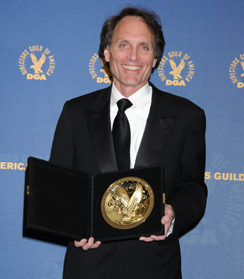 The DGA boasts that its winner has gone on to win the Oscar all but six times since 1948. "This is the most incredible moment of my life," Bigelow said backstage. She downplayed her gender, saying, "I suppose I like to think of myself as a filmmaker." Bigelow was up against Quentin Tarantino for "Inglourious Basterds," Jason Reitman for "Up in the Air," Lee Daniels for "Precious" and her ex-husband James Cameron for "Avatar." "Hurt Locker" star Jeremy Renner called Bigelow "a warrior, my champion and the most fortunate actor's director." Tarantino praised her as "queen of directors." He said his fellow nominees have been spending so much time together, they have become "like a superstar rock band and we're going to go on tour together." Clutching a shiny medallion as a souvenir of his DGA nomination, Tarantino said, "I don't give a (expletive) who wins, I am so happy to have this." Daniels said the nominated directors, who have seen each other regularly throughout Hollywood's awards season, are "like a support group" for one another. "We have each other's backs," he said. He told Bigelow, "You are bold. You are brave. You are gutsy." Reitman told the winning director that he grew up watching her films. "You are more than a great director, you are one of the greats," he said. "I'm in awe of you, too." Cameron praised his competitors as "truly excellent and brilliant filmmakers." Bigelow said just being nominated for the Directors Guild honor is "kind of the pinnacle for the already wild ride 'The Hurt Locker' has put me on." The six-hour affair at the Hyatt Regency Century Plaza hotel drew a spate of celebrities, including Angelina Jolie and Brad Pitt, Jodie Foster, Jon Cryer, Cheryl Hines and Jason Bateman. All but Jolie served as presenters during Saturday's ceremony. Carl Reiner hosted the event recognizing achievements in directing, as he has for 22 years. "Modern Family" won the top honor for television comedy for its pilot, directed by Jason Winer. "I want to thank the DGA for validating the Napoleon complex I've had ever since I was a smaller boy," the diminutive director said. The drama prize went to "Mad Men" and director Lesli Linka Glatter. Ross Katz was honored for the HBO movie "Taking Chance." Louie Psihoyos' film "The Cove" won the documentary award. "The film plays like a prequel to 'Avatar,' only it's real and set in the present," Psihoyos said. 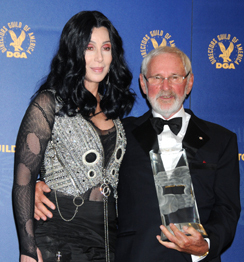 Cher presented Norman Jewison with the guild's Lifetime Achievement Award for his career in film. "The studio heads maybe have all the power, but we've got the glory," he said. "And when you receive the lifetime achievement award like this, it makes you very nervous, like maybe you're going to fall off the perch or something." The 83-year-old filmmaker accepted the award surrounded by his family, including his four grandchildren. Cher said she would have gone to the moon to present Jewison with the honor. "He has changed my life," said the "Moonstruck" star. "I love him so much." Roger Goodman was presented the guild's lifetime achievement award in news direction. Disney chief Robert Iger and Warner Bros. chief Barry Meyer were granted honorary life memberships in the guild. • Reality programming: Craig Borders, "Hong Kong Bridge." • Children's programs: Allison Liddi-Brown, "Princess Protection Program." • Daytime serials: Christopher Goutman (left), "As the World Turns: Once Upon a Time." Among Hollywood's many honors leading up to the Academy Awards, the Directors Guild prizes have one of the best track records for predicting eventual Oscar winners. Academy Award nominations will be announced Tuesday.